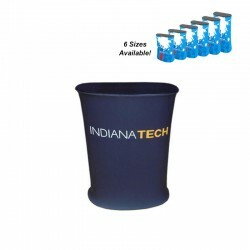 Tension fabric podiums quickly set-up and allow for easy graphic changes. All styles include custom graphic printing on wrinkle-resistant fabric. Best of all, there are no tools required for assembly or disassembly plus all models are compact for allowing for greater portability. 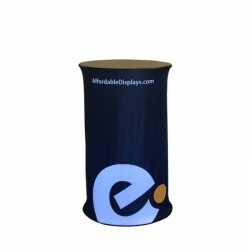 Graphic Podium/Counter includes Custom printed Dye Sublimation Stretch Fabric Graphic & Waveline frame components. 6 counter heights available. 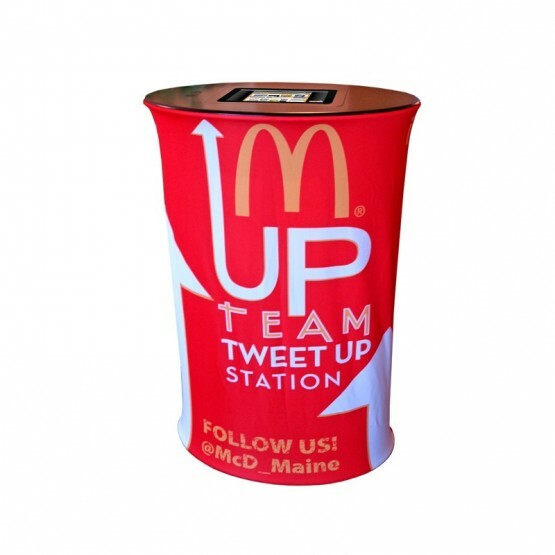 40" h Graphic Podium/Counter includes Custom printed Dye Sublimation Stretch Fabric Graphic & Wave Tube frame components. 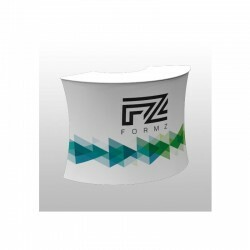 Formz Round Counter includes complete set of tension fabric aluminum hardware, dye sublimation fabric graphic, and circular counter top. 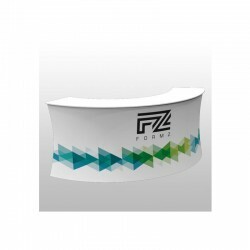 Formz 70" Crescent Counter includes complete set of tension fabric aluminum hardware, dye sublimation fabric graphic and crescent counter top. 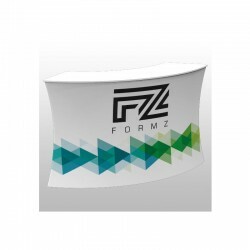 Formz 100" Crescent Counter includes complete set of tension fabric aluminum hardware, dye sublimation fabric graphic and crescent counter top. 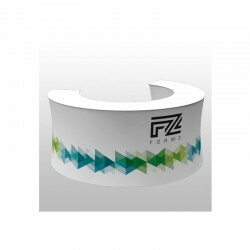 Formz Half-Moon Counter includes complete set of tension fabric aluminum hardware, dye sublimation fabric graphic and half-moon shape counter top. 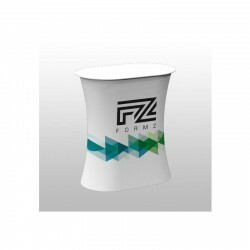 Formz Rectangular Podium includes complete set of tension fabric aluminum hardware, dye sublimation fabric graphic and rectangular shape counter top. 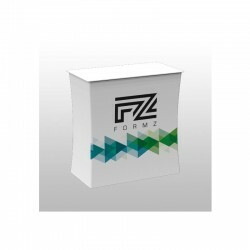 Formz Square Podium includes complete set of tension fabric aluminum hardware, dye sublimation fabric graphic and rectangular shape counter top. 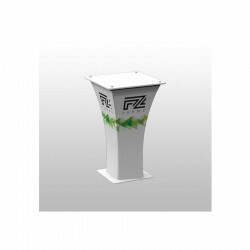 Formz Oval Podium includes complete set of tension fabric aluminum hardware, dye sublimation fabric graphic and oval shape counter top. 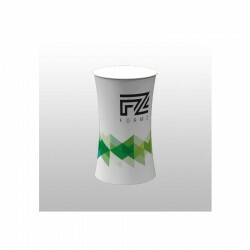 Formz Circle Podium includes complete set of tension fabric aluminum hardware, dye sublimation fabric graphic and circluar shape counter top. Graphic Podium/Counter includes Black counter top, Custom printed Dye Sublimation Stretch Fabric Graphic, frame components and travel bag. Graphic Podium/Counter includes tablet cutout in Black counter top, Custom printed Dye Sublimation Stretch Fabric Graphic & frame components. 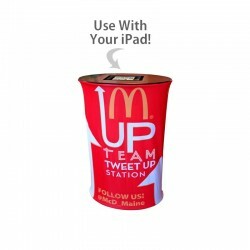 *iPad not included.